The Rev. Dr. Laurie Ferguson says resiliency can be a key to a healthy and thriving congregation. It’s an ever-changing world in which we all live. Whether it’s within the structure of our communities, in dealing with things like the climate or something completely personal, things are happening all around us. In order to stay current with the times, one needs to be resilient. It’s a mindset that the Rev. 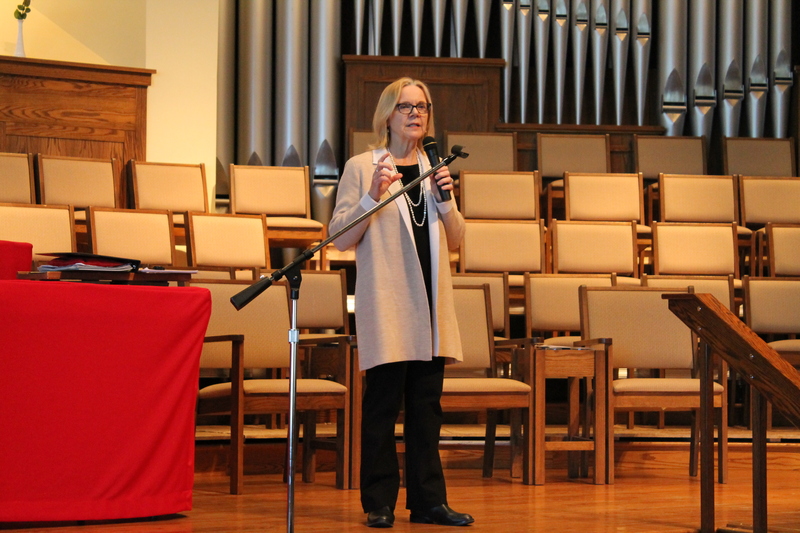 Dr. Laurie Ferguson knows is key, especially for congregations that want to stay connected to their communities. “Resiliency in Ministry and Life” was the topic of discussion at the Presbytery of Donegal’s annual Leader Development Day in early March at Highland Presbyterian Church in Lancaster, PA. 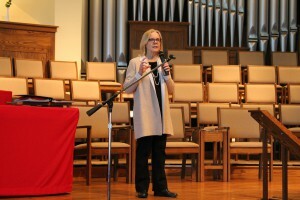 The keynote address by Laurie, a Presbyterian minister from Hudson River Presbytery in southern New York who works as a coach, consultant and psychologist with pastoral leaders, was followed by seven workshops that focused on, among other things, training of clerks of session, ruling elders and deacons. There was also a follow-up conversation on resiliency that focused more on the personal side of it. Laurie pointed to economic, environmental, social and political volatility that occur quickly, unexpectedly and sometimes bring on danger. It creates added pressure for leadership and congregations to prepare and respond in a proper way. “When we think about our congregational life, how do we want to be able to live, preach the Gospel and do our mission in these kinds of times?” Laurie asked. An important component of resiliency, Laurie said, is how people rebound. And that skill is not something that is innate, but instead something that is cultivated and grown. Referencing the book “Resilience: Why Things Bounce Back” by Andrew Zolli, Laurie emphasized that the key to getting back on track is having a center core to return to. Creating a core purpose, which is different from a mission statement, is the hallmark of a resilient organization, Laurie continued. “What are the really significant things we are up to?” Laurie asked. “What is it that really matters to us? What is God calling us to do in this time and place? What wouldn’t be happening in mission if we weren’t here to do it? Another key component to congregational resilience is to be mindful of data like attendance, giving, demographics, enthusiasm and participation in things like mission work. 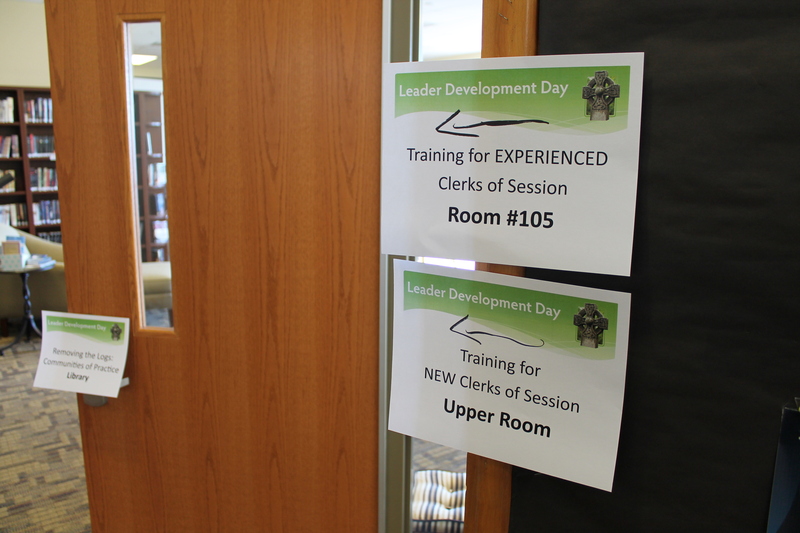 Signs direct attendees to their workshops during the Presbytery of Donegal’s Leader Development Day. Diversity is also a crucial piece for congregations that are looking to be resilient. Much like a farmer who rotates crops in his fields so as not to strip the land of specific nutrients, churches need to be open to different ideas and viewpoints. The final key aspect for organizations that want to be resilient, Laurie conveyed, is a strong community. Having healthy relationships, meaning, shared life and shared purpose are all important when it comes to building resiliency. “The stronger the community is, the stronger and more resilient a congregation or an organization will be,” Laurie added. Laurie suggests that focusing on just one of these aspects (core purpose, real-time data, being adaptive, building strong community) to begin the journey of resiliency will be enough to lay the groundwork for congregations. Beginning session or other meetings on a high note can help set the stage for a productive time. Laurie recommended starting such gatherings by having people say one thing that went well for them in the past week and one thing that the congregation is doing well to get everyone grounded. This time, which can occur in an opening prayer, will allow the group to savor something good and help establish a positive vibe for the rest of the meeting. The proper timing and approach to meetings and activities can be crucial for congregations. It can build up resiliency that can lead to an improved atmosphere and an overall better organization. And that’s certainly a good thing.